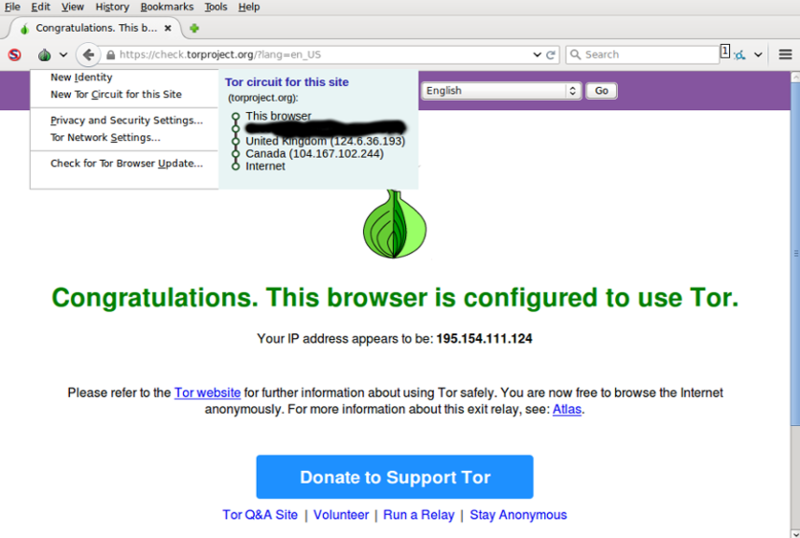 Making an arbitrary number of new circuits (either with the new identity button or when the Tor client creates circuits while browsing) eventually causes the circuit view in Torbutton to show the wrong exit node. When testing this I found that the number of new circuits that are needed to reproduce this varies. Sometimes it happened first time I visited check.torproject.org, other times I spent 10-15 minutes creating new identities. 52 BUILT $GUARD,$F88D1795F4977A3D1D7FCB1E6159ECE53B13A4B4~YesWeScan,$DD8BD7307017407FCC36F8D04A688F74A0774C02~DFRI0 BUILD_FLAGS=NEED_CAPACITY PURPOSE=GENERAL TIME_CREATED=2016-09-10T14:17:15.376318 SOCKS_USERNAME="--unknown--" SOCKS_PASSWORD="6a92a8a6d482f3fdafcbc5e6206efef6"
51 BUILT $GUARD,$C64BD98931AA5C945270CE9C6882FF7AB6603B86~DrInsekTor,$DED6892FF89DBD737BA689698A171B2392EB3E82~ThorExit BUILD_FLAGS=NEED_CAPACITY PURPOSE=GENERAL TIME_CREATED=2016-09-10T14:17:14.376260 SOCKS_USERNAME="torproject.org" SOCKS_PASSWORD="81a70b4ee5a36062744b2f8290e9c706"
[09-10 14:17:29] Torbutton WARN: no SOCKS credentials found for current document. 53 BUILT $GUARD,$8672E8A01B4D3FA4C0BBE21C740D4506302EA487~OrangeLine,$B7828C22ECC3DA13480DAC1ECD4194F89F742EF6~RedMonster BUILD_FLAGS=NEED_CAPACITY PURPOSE=GENERAL TIME_CREATED=2016-09-10T14:17:30.376175 SOCKS_USERNAME="torproject.org" SOCKS_PASSWORD="81a70b4ee5a36062744b2f8290e9c706"
[09-10 14:17:31] Torbutton WARN: no SOCKS credentials found for current document. So, what is the bug about now, after the log got pasted? Originally, I assumed this bug is about the circuit display not getting updated properly (the description goes basically to ​https://i.stack.imgur.com/uRiTV.png). But the tbb-circuit-display keyword got removed with the log. So, if the issue is a different one now, why got this bug hjiacked? The issue is the same as on your screenshot. But it turned out that the reason was different, and circuit visualizer was OK (comment:2). circuits 51 and 53 are for the same domain SOCKS_USERNAME="torproject.org" SOCKS_PASSWORD="81a70b4ee5a36062744b2f8290e9c706". So Tor Check shows IP of the first exit node (CID 51), and the circuit visualizer shows IP of the last exit node (CID 53).